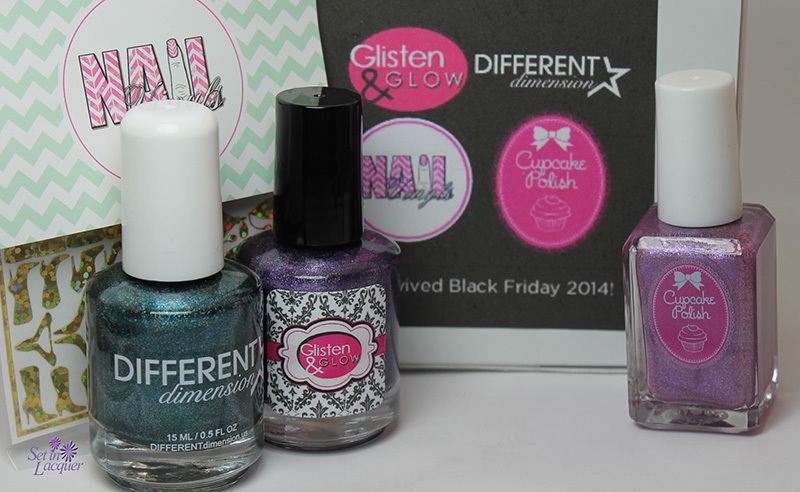 I have an exciting Limited Edition box for you today - I Survived Black Friday 2014. Holy holo Batman! The polishes and the Nail Vinyls are insanely holographic. This collaborative box definitely fits with the Black Friday theme. You will want to be First in Line and avoid getting Trampled by a Shopping Cart. You will Shop Til You Drop and stay Up All Night. This is the mantra of the shoppers that venture into the chaos of Black Friday. But here is something you can get from the comfort of your own home. Three holographic polishes and two sheets of holographic nail vinyls in a gift box will be available from four online store locations. 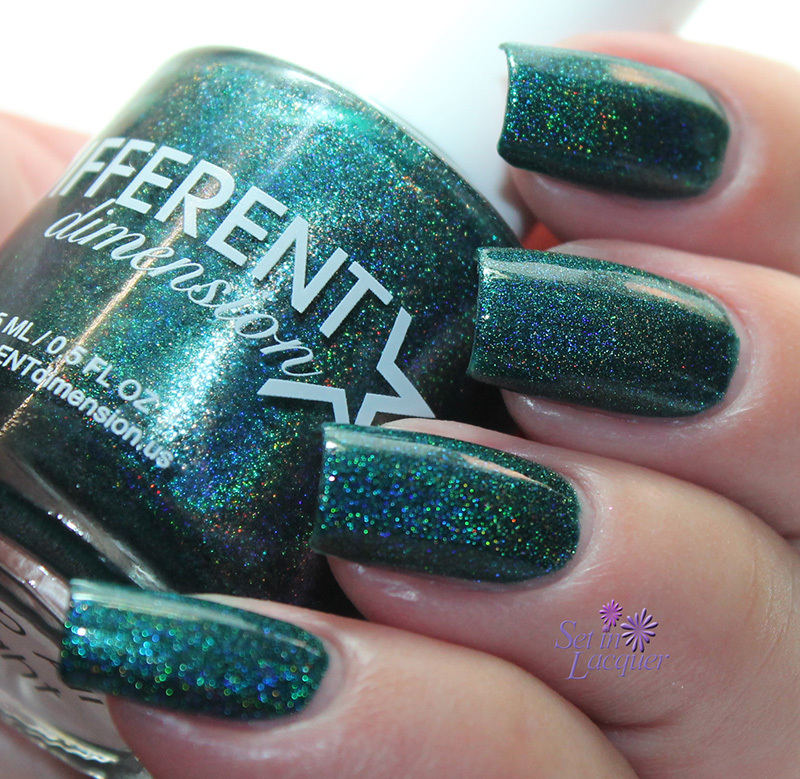 Up All Night from Different Dimension is a glorious deep teal shade with a strong holographic shimmer. This linear holographic polish shines bright with blue prisms and is guaranteed to put some pep in your step. This stunning polish is sure to be an eye-catcher at those holiday functions. This is two coats with a top coat. The photos below are taken in normal indoor lighting as well as direct lighting. The holographic nail vinyls from Nail Vinyls add a flair to your mani with ease. Simply remove from the sheet and press on the nail. Add a good top coat to seal your work. This one is shown with two coats of HK Girl. 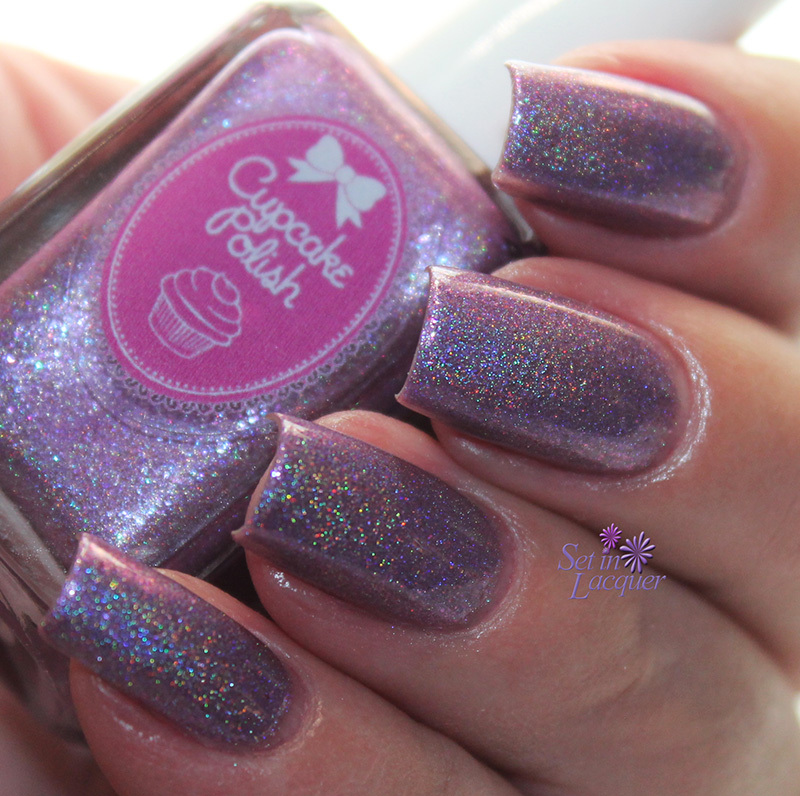 Trampled by a Shopping Cart by Cupcake Polish is a metallic dusty rose shade of polish. 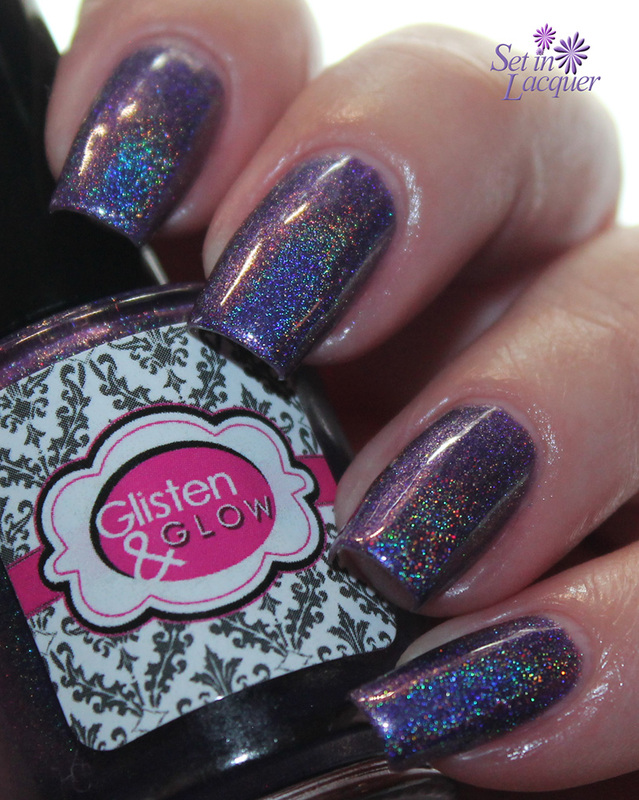 This holographic polish is classy and vibrant. The holographic illusion is strong without being overpowering. This is two coats with a top coat of HK Girl. The photos below are taken in normal indoor lighting as well as direct lighting. Silver nail vinyls highlight the polish perfectly. Of course I had to use the nail polish bottles with the brushes. 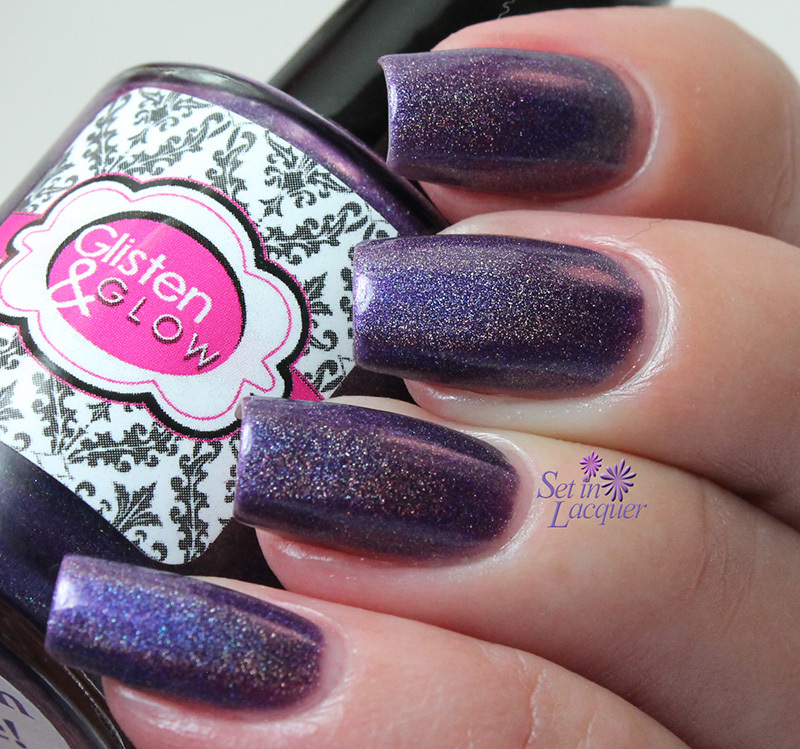 First in Line by Glisten & Glow is a stunning deep plum shade with a vibrant linear holographic shine. The holographic prisms are primarily blue and green with a touch of bronze. This shade will be perfect for those outdoor holiday events, or simple nights by the fire. This is two coats with a top coat of HK Girl. The photos below are taken in normal indoor lighting as well as direct lighting. 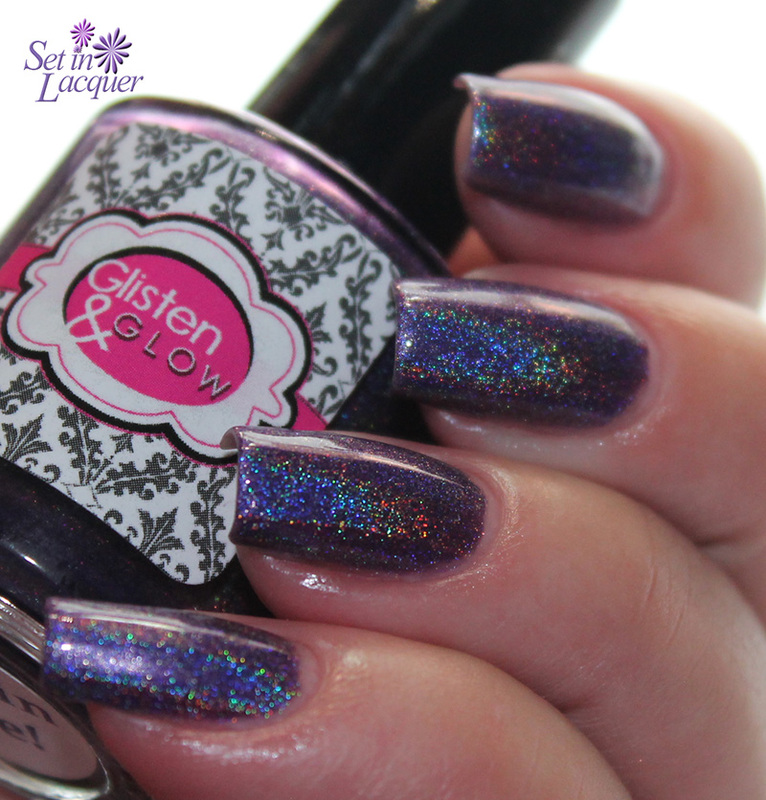 This holographic perfume atomizer is the perfect accent for this polish. I used two coats of HK Girl to seal in the design. Nail Vinyls by nailvinyls.com are also included in this special edition box. I love Nail Vinyls. I consider them to be quite life changing. Especially the guides that help you paint with precision. These holographic nail vinyls are meant to complement your mani. The holographic shimmer in these is strong and is sure to be an eye catcher. Shoes, boots, handbags, nail polish, perfume and more are represented in this set. This collaboration box - I Survived Black Friday will be available from 12:01 a.m. EST and 1 p.m. EST, Friday, November 28. The box can be purchased at glistenandglow.com, differentdimension.us, cupcakepolish.com and nailvinyls.com. Make sure to grab your "I Survived Black Friday 2014" limited edition box. These polishes and nail vinyls were provided to me for an honest review. All opinions are my own. Please note that computer monitors may display colors differently.